We decided to get out about about and get some exercise. 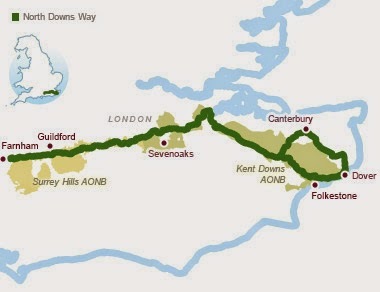 My suggestion was to walk the first leg of the North Downs Way - a long-distance path that runs from Farnham to Dover and is 153 miles long. We caught the train down to Farnham where my parents live; we decided not to drop in but, instead crack on from the station. We quickly met the River Wey which, at the very start of the walk, is little more than a ditch but soon expands to a stream. We crossed a small tributary of the Wey with a cute folly in the shape of a bridge. By half way through the walk the Wey looked like a proper river. The route is gently undulating with no real ups and downs. In theory an easy navigate but I did miss one turning as you can see on the map. A good part of this stage runs parallel to the Hogs Back along country lanes and through lovely deciduous woodland. The last mile was a bit of a forced match to catch the train and avoid an hour's wait for the next. We made it with about 45 seconds to spare. I am guessing that we will eventually do the complete walk.